GORDIE HOWE WITH THE CANADIENS? Ever wonder what would have happened had Gordie Howe played for the Canadiens alongside the likes of Maurice Richard and Jean Beliveau? Believe it or not, it almost became a reality in the fall of 1946. During a scouting trip that year that included a look at the Red Wings’ affiliate in Omaha, Canadiens general manager Frank Selke was blown away by the performance of a promising young prospect named Gordie Howe. 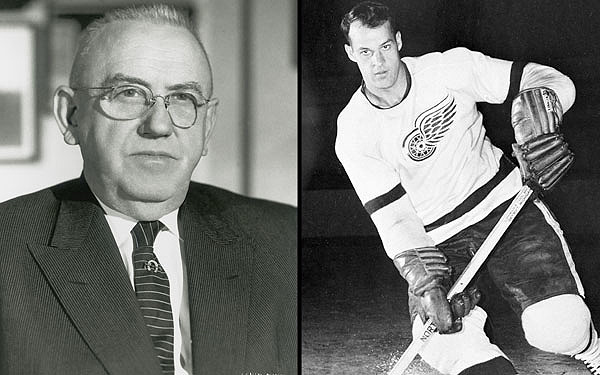 After doing a little digging, Selke discovered that Howe had been left off the Red Wings’ negotiation list by Knights coach Tommy Ivan, making the future Mr. Hockey available for any NHL club wishing to claim him. Before heading back to Montreal, Selke stopped into Detroit to have a little chat with Red Wings GM Jack Adams. Wisely, Adams took Selke’s warning to heart, quickly determined the player in question was Howe, and then added him to Detroit’s negotiation list. The rest, of course, is history. Howe would go on to become one the greatest players in league history, not to mention a perennial thorn in the side of the team which had the opportunity to claim him. The question, of course, was why did Selke do it? How could he let Howe slip through his fingers? Years later, his son Frank Jr. explained the reasoning behind his father’s decision to take the moral high road. Selke did exactly that in leading the Canadiens to a league-record five straight Stanley Cups from 1956 though 1960.